The Angry Robot booth at ECCC 2018. Eric Scott Fischl, Alex Acks/Wells, Michael Underwood, Adam Rakunas, Joseph Brassey, Jasmine Gower. I can manage deadlines. Which is not to say that they’re not intimidating. Going into this, one of the big questions I had for myself was what the writing experience would be like on a deadline. With Quietus, I had all the time I needed for research, for drafting, and pre-editorial revisions. The only part of that project that was done with a time limit were the editorial revisions and copyedits. If it wasn’t for everything else that was anxiety-inducing about publishing a first novel, it would have been almost relaxing. Terminus was different. Having a set amount of time to research, draft, and do initial revisions was quite an experience. I’ve never had to schedule a novel before. Everything has always been able to take as much time as it needed. There was the added pressure of knowing, with the contract already signed, that people were depending on me, there were no mulligans, and only a set amount of time to correct any mistakes. I got it all through on time. What’s more, I did not, in fact, die of anxiety. I did not think I would, but thinking and experiencing are two different things. Now I’m even more prepared for the next time. Getting Terminus’s cover reveal while I was still drafting was exhilarating. When it was first publicized, I had just finished writing the scene on the cover a few days before. That felt like writing for a live audience. Admittedly, with Terminus, I did have a lighter schedule—in that I only had a full-time job. With Quietus, I had four jobs. One forty-hour-a-week, one ten-hour-a-week, and two five-to-ten-hour-a-week jobs. Somehow I managed to find the emotional energy to write about the Black Death in the meantime. I’ll take deadlines over that any time. Always keep moving. When I was drafting Quietus, it was difficult to see past the event horizon of my first book’s publication. Anything afterward was so mysterious and unknowable that it might as well not have existed. I’ve fallen into the event horizon, now: my first book hit shelves. And then my second. There is no win condition in this career, just milestones. Moreover, there will always be setbacks, remaindered books, unreturned e-mails. Expect them. Ordinary parts of the business can seem like disasters if you’re not prepared for them. Push hard, have fun. Writing is a lifestyle and work, not a money-making scheme. There’s no point for me in doing it if I don’t enjoy it. One of the most professionally enriching, personally rewarding things I’ve done since publishing Quietus was work at the Angry Robot booth during Emerald City Comic Con. More importantly, though, it was a blast. 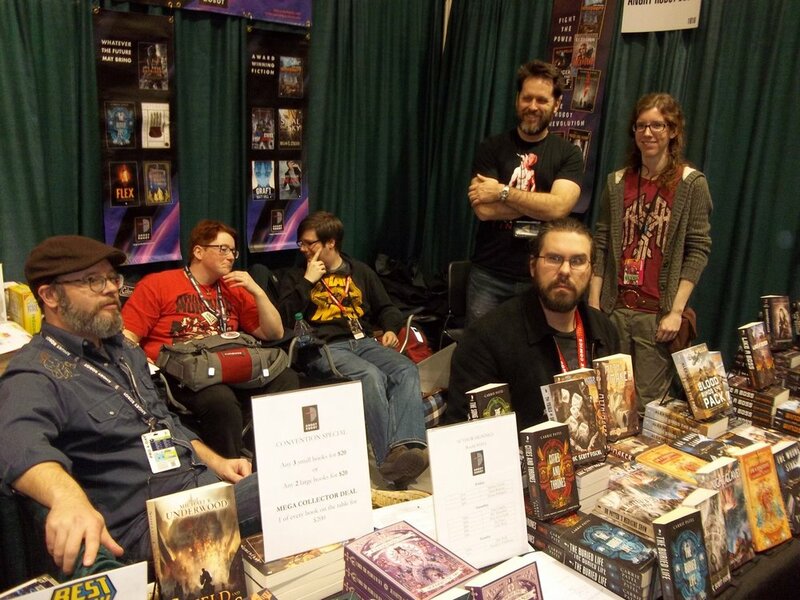 I connected with amazing people, lived and breathed my genre, presented at my first panel, and signed copies of my debut novel on its day of release. The “professionally enriching” part keeps me alive, but it’s everything else that makes me want to live. I could’ve found “professionally enriching” experiences in plenty of other fields, but I chose this one for a reason.